Fans will get a special look at new footage from Star Wars: The Force Awakens later on tonight, during ABC's Thursday night lineup of Scandal, Grey's Anatomy and How to Get Away with Murder. 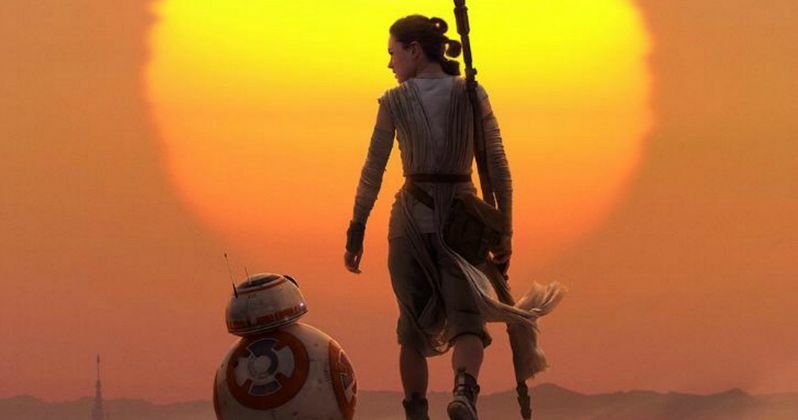 If you can't wait that long for your Star Wars fix, then you're in luck, because IMAX has just debuted their official poster for the sci-fi sequel, featuring Rey (Daisy Ridley) and BB-8 traversing the desert landscape of Jakku. If that still isn't enough, we have three banners plus a Disney Channel promo, which shows never-before-seen behind-the-scenes footage and announced that another sneak peek at Star Wars: The Force Awakens is airing during a new episode of Girl Meets World this Friday, November 13 at 8:30 PM ET. The IMAX poster doesn't reveal any new information, but we did recently learn more about the lovable ball droid BB-8. A report surfaced last week that confirmed BB-8 is actually a female droid, and that she doesn't actually belong to Rey, which has long been assumed since she is often seen with the diminutive robot. It was revealed in the international trailer trailer that Rey merely discovers BB-8 at some point during her journey, and that same report also claims that the robot has a pivotal role in the story. A rumor surfaced in February that a character known as The Vicar, presumably played by Max von Sydow, obtains a mysterious lightsaber and contacts the Resistance, who send Poe Dameron (Oscar Isaac) to investigate. Poe then places the lightsaber within BB-8 and sends him on his way, and it is reportedly this lightsaber that Kylo Ren (Adam Driver) is seeking. We don't know if Rey meets up with BB-8 before or after this lightsaber exchange, but hopefully we'll find out more about this intriguing droid soon. As for the new promo, we get tiny bits of new footage from one of the Resistance's bases, with the Disney Channel correspondent seen sitting in the Millennium Falcon itself, alongside Chewbacca. We also get a new shot from the movie itself, which shows the Falcon flying towards the mysterious forest planet we've seen in the trailers and TV spots. It isn't known what else will be shown during this Disney Channel sneak peek, and it isn't known if the footage will debut online after premiering on the network. While it seems like a long shot at this point, perhaps the new footage revealed tonight on ABC and tomorrow on ABC Family will give us our long-awaited first look at Mark Hamill's Luke Skywalker. The cast includes John Boyega, Daisy Ridley, Oscar Isaac, Adam Driver, Mark Hamill, Harrison Ford, Carrie Fisher, Domhnall Gleeson, Lupita Nyong'o, Gwendoline Christie, Andy Serkis and Max von Sydow. J.J. Abrams directs Star Wars: The Force Awakens from a script he co-wrote with Lawrence Kasdan, with the director producing alongside Kathleen Kennedy and Bryan Burk. Take a look at the new IMAX poster, banners and the Disney Channel promo, and stay tuned for more on Star Wars: The Force Awakens, in theaters December 18.